After a bit of a late Summer / early Fall hiatus, we are happy to report that The Creative Team at Booze Dancing TV has discovered two very fun sounding boozy beverages for us to review in our second episode of A Tasting at the Murder Table. In other words, Booze Dancing TV is BACK ON THE AIR! Bom Bom Coco Mochanut: An award-winning premium Caribbean rum made with cream, chocolate, coconut, and coffee flavor. 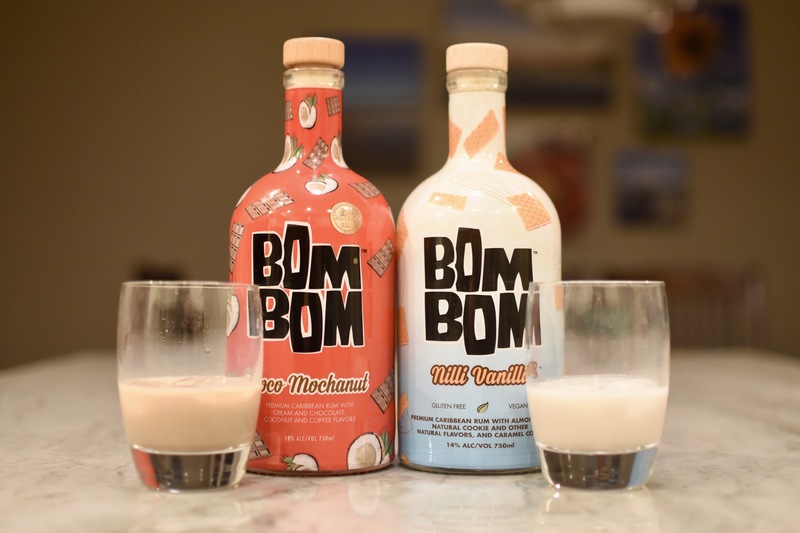 Bom Bom Nilli Vanilli: A premium Caribbean rum made with almond milk, natural cookie, other natural flavors, and caramel color. It’s also gluten free and vegan. Our original plan was to have “Our Better Halves” join us for this tasting, but due to circumstances beyond our control, we were never able to make it happen, so we decided to just go it alone and review this Bom Bom booze without them. Knowing what we know now about these cream liqueurs, it’s a pity that they couldn’t find time in their “busy” schedules to join us because I think they would have really enjoyed these boozy beverages. Bom Bom Coco Mochonut was launched in early 2016 by Kevin and Eva Maria Mowers. The concept, branding, and product strategy were managed by Patricia Verdolino and Richie Beretta of a firm called Cops and Robbers. Rumchata and Bailey’s Irish Cream are direct competitors. The initial target audience for this product was millennial women from 21 to 31 years of age. Just so you know, prior to our filming of this video, Limpd and I knew very very little about Bom Bom Brands and their two cream liqueur concoctions. In other words, what you are about to see and hear in our second installment of A Tasting at the Murder Table are our very first impressions of Bom Bom’s Coco Mochanut and Nilli Vanilli. We hope you enjoy the show! Many thanks to Bom Bom Brands and Lori Edelman of Second Self Media for sending us these very generous samples! Great article. Thanks for the shout out. Always a pleasure, Arthur! Cheers! So glad you enjoyed shaking your BOM BOM! We have lots of great recipes to help you #ShakeYourBomBom through the holiday season (Eggless Egg Nog De-lite, Peppermint BOM, Caribbean Coffee, Espresso Martini and of course our signature Skinny Snowflake Martini). Thanks for the comment, Eva Maria (Ave Maria???)! Bom Bom was good fun and quite delightful. Thanks for sharing! Yo Rebs! It was dee-lish! Unlike G-LO (an omnivore), I wasn’t sure that this combo would work. Boy was I wrong! True. I will eat pretty much anything. Except persimmons and sea urchin. Not a fan.